This year however I will have a four-week old baby at Easter so I definitely won't be doing anything like that! In fact it's my husband's birthday and I make him a showstopper chocolate cake every year but I knew I wouldn't have time to do anything remotely time consuming and there was a chance I wouldn't even get time to bake a basic sponge cake, so I've enlisted the help of a local lady who runs a baking business and for the first time ever am actually buying a birthday cake rather than making it - which is a bit of a shame but needs must, and I'm sure it will taste great. 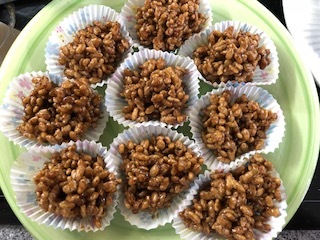 I was starting to miss baking though especially at Easter so I decided I could just about manage making some rice krispie cakes. I used to love them as a child, and still make them every once in a while now! 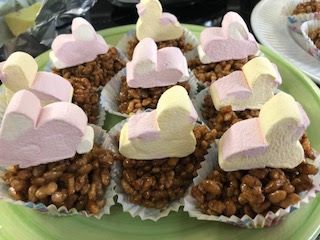 You can make them look like little nests with the addition of a few mini eggs but I used some Easter marshmallows from Lidl, in the shapes of chicks and rabbits. They are a bit big for the 'nests' perhaps but never mind! Here's a quick and easy recipe that is fun for children to join in and make with you - just be careful when melting the chocolate. Melt the chocolate in the microwave or a bain marie then stir in the chopped butter until melted. Stir in the golden syrup. Place the Rice Krispies in a large bowl and pour over the chocolate mixture, stirring gently until all the cereal is coated. Spoon into paper cakes cases and leave to set - they will set at room temperature but you can also put in the fridge. Decorate with mini eggs or marshmallows or anything you like - or eat them as they are.